haleakala is the largest of hawaii's three national parks at over 30,000 acres and features a peak elevation of over 10,000 feet. the drive up is spectacular and has views of the rest of maui and other hawaiian islands. the volcanic peak is classified as "active" by the USGS and there are many lava flow hazard zones all over the park and the crater. looking out over Haleakala crater, leading down into the center cone of the active volcation. you're looking at an elevation of about 8500 feet here. road up to the summit, the rest of maui is in the background. around 4000 feet here. you can notice much more greenery than towards the summit. a bit higher up, about 6000 feet here. you can see the greenery is less lush and the terrain is a bit rockier. here it's well over 10 degrees warmer than at the summit. just below the summit at 10,000 feet. it's thirty degrees cooler here than at sea level. one of my favorite things about the park - haleakala's "science city," with obervatories run by u.s. department of defense, university of hawaii, the smithsonian institution, air force, federal aviation agency, and others. astronomers view the night sky and US spy satellites are tracked here as well. view of the crater from just over 10,000 feet at the summit. low elevation view of maui, aboout 2000 feet. you don't pass through the official park entrance and outer boundary until about 4000 feet on the road so there are usually cows grazing here on private land. the road to hana is hawaii state road 31, a 70-mile journey to and past the city of hana. the city itself is the eastern most point on the island of maui and home to the hawegasa general store, made famous by paul weston in his 1960 song the hawegasa general store. the road itself is a myriad of hairpin and u-turns along the side of mountain ranges. rarely can you travel over 15mph as you wind down hana highway. these panoramas were taken in hana and at some of the gorgeous sites along the way. lovely view of the ocean about 20 miles from hana. gorgeous bay. as I took these shots the sun came out towards the end of the run - you can see the right side of the photo is much sunnier! you can see some houses and private plots of land on this little outcropping below the road. some hotel bungalows on the ocean bluff in the town of hana. while honolulu certainly isn't the most naturally beautiful or relaxing place to visit in hawaii, i was fortuante enough to have an interesting view from my balcony of the intercoastal (located here), some of its larger buidlings and the mountains in the background. these are identical panoramas taken mid-day and at dusk. kanaha beach park is incredibly popular with long board and kite surfers on maui. the beach itself is over a mile long on maui's north coast and easily accessable from the roadway. because the road is on the cliff overlooking the beach, there are some great views to be had. 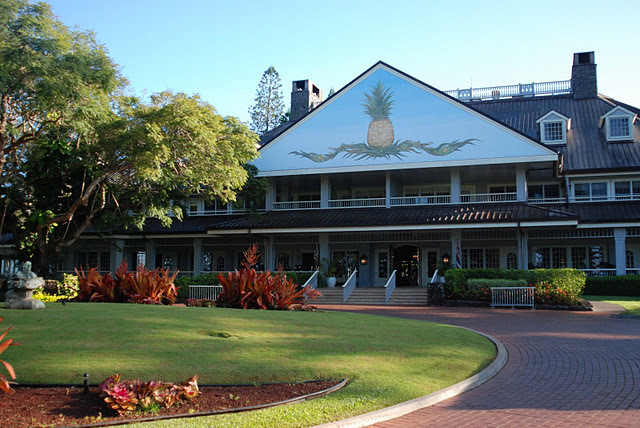 lana'i is the sixth largest hawaiian island and, until 1985, was the primary plantation of the dole pineapple company. now owned by the murdoch family, it has two four seasons (the lodge, where these panoramas were taken from, and the bay, a beach resort on the ocean) are separated by over 1000 feet of elevation and a 25 minute drive. the island itself only has 30 miles of paved road and about 2000 full-time residents, almost all of whom work for castle and cook, who operate the resorts and much of the services on the island. a view from the back property at the four seasons koele lodge. this pond had hundreds of japanese koi in it. these three panoramas were taken on and around the grounds of koele stables, the island's horse farm. at an elevation of 1000 feet, the island looks quite barren and arid. the rows of pine trees were planted to help irrigation and forestation of the island. the experience at koele is a greg norman-designed course in the mountains of lana'i. truly some breathtaking veiws on many of the holes including the island green on hole 8 and the 300+ foot elevation of hole 17.